Now you can be Ezio, Altair or Connor Kenway of the Assassin’s Creed, but in a cubical world and pixelated as in Minecraft. AssasinCraft 1.7.2 and 1.7.10 is a mod that allows us to have several elements of the famous game Assassin’s Creed. We may use the armor of Ezio, Altair and Kenway Connor, have at our disposal a good variety of weapons that you’ve played the game you already know. Also added “guilders” as currency, which will help us to buy things to NPC’s, new blocks, craftings and objects with new functions. How to install AssasinCraft Mod for Minecraft 1.7.2 and 1.7.10? Paste the downloaded mod file into .minecraft / mods folder. 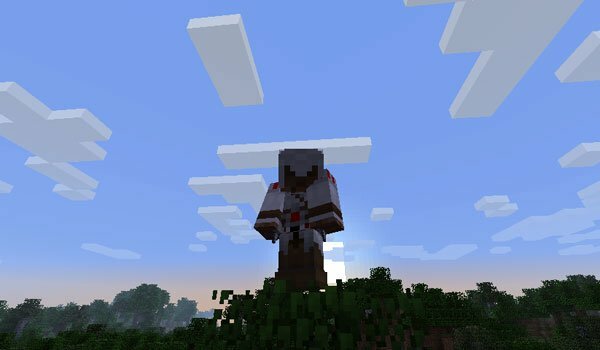 Assassin’s Creed comes to Minecraft! i have a question!!!!! I saw the dual weilding and my jaw dropped so i got the mod and the dual weilding isnt like in the video it just shows the item in my right hand and if i press f5 it shows it in my hand and head so please hep??? I downloaded the file and put it in the .minecraft mods folder and I pull up minecraft in forge and it says no mods?